SchooDoodle.com has the classroom pocket charts and teacher supplies that schools need. 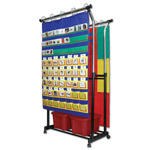 We offer dozens of classroom pocket charts in various colors, sizes, and shapes. Schoodoodle also sells classroom bulletin board sets, calendar sets, and incentive charts.